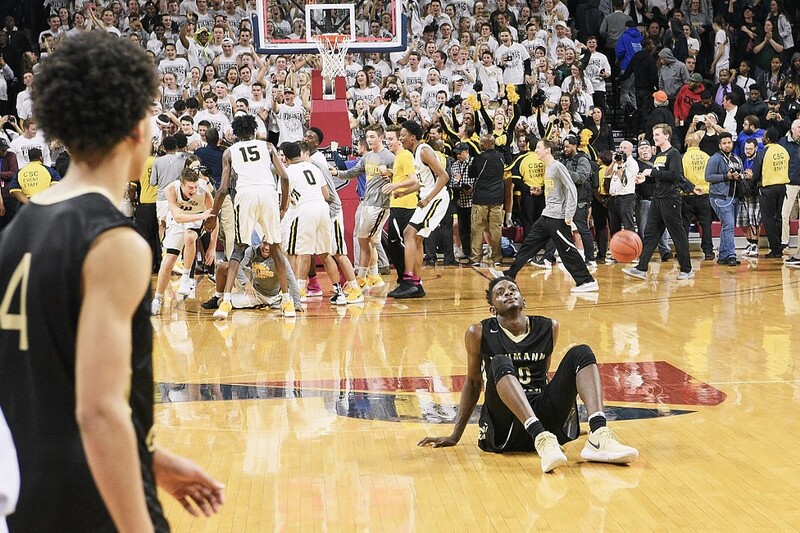 Neumann-Goretti senior Dhamir Cosby-Roundtree expresses his emotional pain following Monday’s loss to Archbishop Wood at The Palestra. There is no secret that 13 is an unlucky number. When was the last time you stayed on the 13th floor of a hotel? But in Monday’s Catholic League boys basketball championship game at The Palestra, 13 didn’t seem so bad, as Neumann-Goretti was leading Archbishop Wood at halftime, 31–18. Seven is the other number that the Saints are going to have a tough time forgetting, as in the number of points the East Passyunk Crossing squad ended up losing by in the title tilt, 65–58. For Wood, which is coached by former Neumann-Goretti assistant John Mosco, the victory is a historic one as it’s the first time in the program’s 51-year history that the Vikings can call themselves Catholic League champs. Getting back to the number 13, it’s the largest halftime deficit a champion has overcome. The local squad ended up being outscored 25–11 in the third quarter. Quade Green, a University of Kentucky signee, led the Neumann-Goretti offense with 18 points and sevens assists. Dhamir Cosby-Roundtree, who will be heading to Villanova University in the fall, just missed out on a double-double, finishing with 8 points and 11 rebounds. Sure, this marks a third straight heartbreaking title game loss for the Saints, with the previous two coming at the hands of rival Roman Catholic, but the focus has shifted to the City title portion of the postseason. The District 12 Class AAA title game is taking place 2 p.m. Saturday (March 4) against Del Val Charter at St. Joe’s Prep. Then it’s on to states. The girls basketball team saw its Catholic League run end in last week’s semifinal action, falling to eventual champs Cardinal O’Hara, 57–42, at Philadephia University. The Saints, who dropped to 18–5, had defeated O’Hara during the regular season. Chyna Nixon, 12 points, and Jabria Ingram, 11 points, led the Saints offense. But on this night, O’Hara was simply the better team. The Saints are hoping to regain that rhythm on Saturday when they face Imhotep Charter for the District 12 AAA title at Philadelphia University (12:30 p.m. tip). “We have been working hard on getting better every day at practice,” she said. “[The Catholic League] part of our season is behind us, so now it’s time to take the on the next part starting this Saturday against Imhotep.